our urban cottage: Adelaide is 8 months old. Adelaide is 8 months old. She is mobile, but not really crawling. More like doing the worm across the floor. No teeth and no sleep. Smiles every time anyone sings, "The Itsy Bitsy Spider". Thinks Genevieve hung the moon. I love that she is growing. Even though she is likely our last baby, I love watching her get bigger and bigger. I was more sad about Genevieve growing older but with Adelaide I am just loving each stage. The only thing I am sad about is when she starts acting like a toddler ;) She is so sweet and innocent right now and can do no wrong in my eyes. Once the tantrums start, I'll miss my baby. But I know that comes with development. So I am just cuddling her all day, every day! As she gets older the tantrums are slowing down and the communication is increasing. She is still not super verbal but every day we feel like we are understanding each other more and more, and what a difference that makes! She is back in school, finally! I am so happy and she loves it! Potty training is still not successful. I am sure one day she'll be out of diapers. The tantrums have decreased but the curious behavior is on the rise! 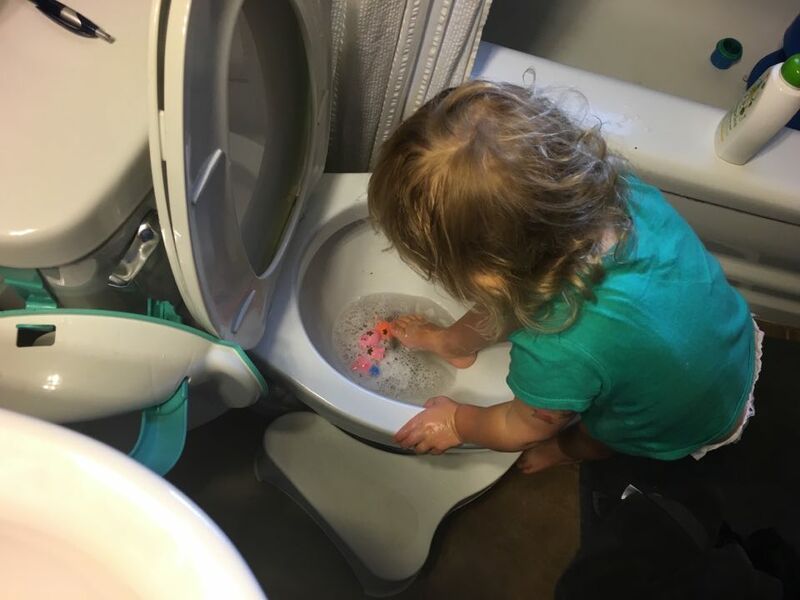 Like sitting in the toilet giving her toys a bath. Trying to foster her imagination while still having a sane household. Biggest news, I started school. Crazy. Night classes as an adult learning are so different than undergrad when I was 18 and had no responsibilities. I am loving having those 6 hours a week to focus my brain on Anatomy and Physiology instead of diapers and nursing. It's A LOT of studying but I am really enjoying it. One step closer to midwifery school. It was mine and Michael's birthdays this month which means we also ate so much good food! Butcher and Bee, Nomzilla, City House, and 5th & Taylor were all so incredibly delicious. This was also the second year we did the InterNASHional Food Crawl, a restaurant tour of 6+ ethnic restaurants off Nolensville Road. If you haven't done it, you should! And we had lots of family hang time. My daughters love each other so much. It is one of my most favorite things in the world. I mean, they both beam when they see each other. I want that love to grow as they get older. I just love watching the two of them interact. Well, you aren't getting better at sleeping. Somehow you are getting worse. I didn't think that was possible! Maybe this month you can sleep longer than 2 hours at a time? It seems that 3-5am is your favorite time to play with your toys. But at least you are finally taking a bottle! That makes going to class so much easier on me. I just adore you and how you smile every time you see me. I want to bottle up this feeling where I am your whole world. I know that is not forever, but I am LOVING it right now. And watching you explore as you learn to crawl has been so much fun. You are turning into a little girl before my eyes. Before long you will be one! What?! I love you precious one.